I know when the trailer first premiered a mere two months ago, I considered giving Dark Shadows a chance with some enthusiasm, but then I snapped out of it after remembering all the times the Unholy Trinity (Burton, Depp, Carter) has shat upon the world of film in the last decade, especially when it comes to "re-imaginings." 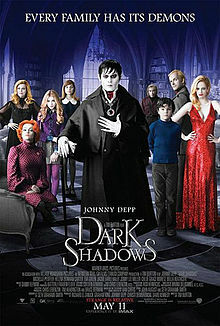 Thus I have no love for Barnabas Collins and his whackadoo band of 70s misfits. There is a tiny chance I'll check it out on $5 Tuesdays during my staycation in a few weeks. Otherwise, Avengers, keep on avengin'! Yeah, I was shocked to see The Hunger Games back in the #3 slot after so long. Who knows what will happen. I have no interest in seeing this either. I considered seeing THG again last weekend while Mia was away, but refrained. I still wanted to though, so I can't blame anyone keep that in Top 5 at the box office.